This thread is the first of what I plan to be a series of several threads concerning my ABC Preon Model. I look forward to everyone’s comments. To get started, I’ll first present a review of how the science of elementary particle physics got to where it is today. The figure above shows a portion of the particles that were discovered using particle accelerators. The number of such particles became so large that it was termed “a particle zoo”. It was clear by the early 1960’s that the number of particles discovered was getting so large that there was likely some underlying pattern that could simplify our view of elementary particle physics. A major step forward in simplifying mankind’s view of nature occurred in 1964 when Murry Gell-Mann and George Zweig proposed an underlying model. Gell-Mann had used the term quark for the elementary particles, while Zweig had used the term ace. Eventually, the term “quark” was accepted by the community. In the quark model, Hadronic matter is proposed to be built from underlying quarks. Baryons are states that have three bound quarks, while mesons are a bound quark-antiquark pair. Leptons were identified as a separate type of matter. As a result, in 1964, simplicity was reestablished. Nature consisted of three quarks, named up, down, and strange, and four leptons, which were the electron, the muon, and their two associated neutrinos. The initial simplicity of the quark model began to fade into complexity almost immediately. In 1965 Glashow and Bjorken proposed a fourth quark, the charm quark, which was discovered by Richter and Ting in 1974. In 1970 Kobayashi and Maskawa theorized that CP violation in experimental results could be explained by adding two more quarks, and indeed these quarks were discovered by Ferimab researchers. The bottom quark was discovered in 1977 and the top in 1995. Also, over the period between 1974 and 1977, a new lepton, the tau, was discovered at SLAC by a team of collaborators. In addition to the quarks and leptons, force carriers are a central part of today’s standard model. In 1979, Glashow, Weinberg and Salam proposed the electro-weak theory of particle interactions to unify the weak and electromagnetic forces in a single theoretical framework. This work predicted the existence of three more particles, which were called the intermediate vector bosons. The weak bosons, called the W and Z, were discovered by a team at CERN led by Carlo Rubia in 1983. Simon van der Meer enabled the discovery by leading the development of stochastic cooling of particle beams. Note that the W boson comes in two types, one with a positive electric charge and the other negatively charged, while the Z particle has zero electric charge. In the figure above we see a depiction of the standard model for elementary particles as advertised by its proponents. The depiction shows a rather simple set of 16 particles, which includes six quarks, six leptons and four force carriers. Despite the advertised simplicity of the standard model, the model has several problems that leave it rather unsatisfactory from a philosophical point of view. The first additional complication is that the rules used to form particles involve a color charge. 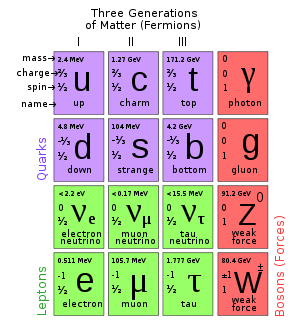 It is of course perfectly acceptable that nature may employ otherwise identical particles that have one of three color charges, but the downside is that this means that there are actually three quarks for each one listed in the figure above. The theory also specifies that there are eight different gluons, not just the one shown above. 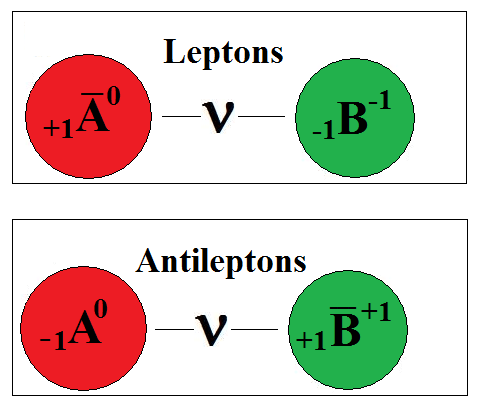 Secondly, each quark and lepton shown in the figure above has an antimatter counterpart. This too is OK, even necessary, but it means that there are twice as many particles than the number advertised above. And beyond the counting slight of hand, there are additional problems. Fundamental to present theory is the result that no quark can be isolated. As quarks become separated from their partners, the theory stipulates that the force pulling them back in gets ever larger. 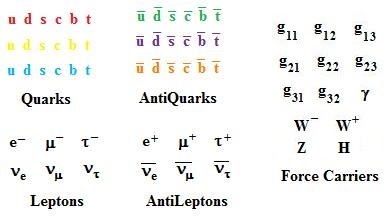 Before a quark can be freed, separating it involves a force so large that the energy associated with it is capable of generating a quark antiquark pair, and each member of the pair then associates with the fragments of what was being pulled apart, so no quark can ever be isolated. In light of this, as philosophers we should ask: How can something be proven to exist if it can never be isolated? I would submit that such existence can never be proven – only inferred. Another problem is that the weak force has no direction. Typical forces such as the electric, magnetic and gravitational forces have both magnitude and direction. They are vector quantities. But the weak force is really a particle exchange phenomena that has no direction associated with it. A last known problem is that there is no satisfactory calculational framework for the standard model. There are many good approximation schemes, but the mathematics is not anywhere close to the elegance and accuracy of quantum electrodynamics. This makes it hard to compare results against theory to test the model. (For instance, a pion is presumed to be a two body state. The two body problem is well known, yet there is no standard model prediction for pion masses.) For all of these reasons, despite its success, it took quite a while for the quark model to gain full acceptance in the physics community. I recall back in the early days speakers starting their comments by saying, “in what is now the standard way of doing things” and eventually “in what is becoming the standard model of our field”. The standard model was indeed the model that became the standard way of looking at things, but early on everyone was under the belief that something better would soon come along. Above we see a figure that is more honest in its presentation of the existing standard model. 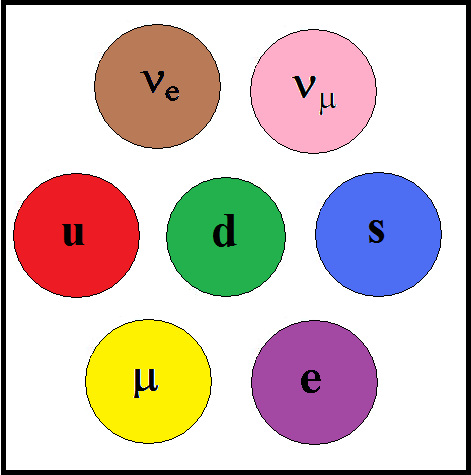 Shown above are each of the three colors of each of the six quarks as well as their antimatter partners. Also shown are all six leptons along with their antimatter partners. Lastly, all the force carriers are shown. With this full accounting of particles it is seen that the standard model involves 61 elementary particles, since there are 18 quarks, 18 anti-quarks, 6 leptons and 13 force carriers. While some standard model proponents may argue that a red up quark is the same as a blue up quark, the rebuttal is that we certainly don’t believe that a positron is the same particle as an electron. Even though a positron is identical to an electron in every aspect except for its electric charge and lepton number we still recognize that any such difference means that the particles are different particles. Similarly, an up quark with a red charge should be recognized as a different particle than an up quark with a blue charge if we are going to have an honest appraisal of our elementary particles. With this honest appraisal it is clear from the diagram presented above that the standard model has reached the point in its development where a simpler underpinning is desirable. The treatment I have presented here so far has focused solely on a mental picture of what particles and forces make up our world. But modern physics in general, and the standard model specifically, is considerably more than just a physical model. Indeed, there are many who take the position that a physical model of nature is not something we as mere mortals are even capable of understanding. That latter philosophy dates back to relativity and the early quantum theories, theories that originally seemed quite odd, but theories that survived every important test. And therefore, with the underlying physical modeling so difficult to mentally grasp, modern physics turned toward mathematics and underlying principles instead of physical mental pictures. Between them, the principle of relativity and the principle of least action have been used very successfully to blend into a Lagrangian approach that has produced a mathematical understanding of our world. 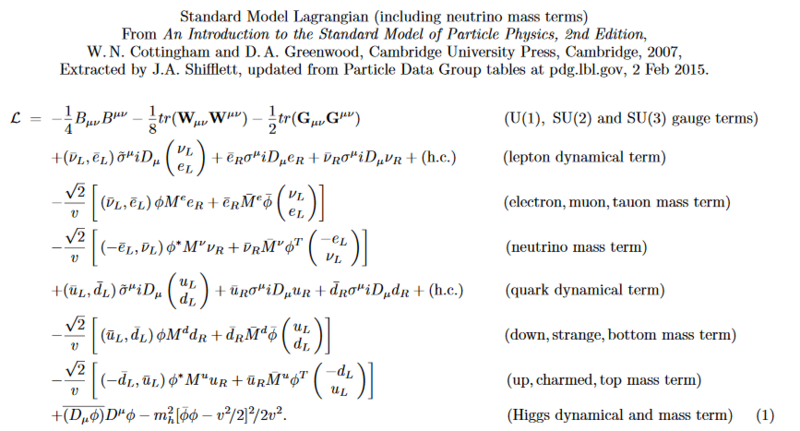 The pictures above are rather gross simplifications of the true theory, and while those simplifications are useful to describe things to the public at large, the truer picture of the standard model comes from the Lagrangian, which is far more complex that even the rather complicated picture of 61 “elementary” particles. Of course, there are many good things about the standard model. First, it gets everything right. No known experiment is in violation of the standard model. And whenever new experiments indicate that something might not quite fit, the standard model has exhibited the room for growth needed to accommodate any new experimental results. Mixing angles and renormalization, as well as additional quarks and leptons have been added to the model over time. The analysis techniques are extremely complex, and it takes a decade or more to master them. A full Ph.D. in physics, as well as post doctoral training, are usually needed to fully grasp the intricacies of the model, and even then, practitioners may only be truly expert in a small portion of the overall model. Furthermore, development of the standard model has involved man-centuries of effort by some of the best, brightest and most trained members of the globe. As a result, the standard model is a monument to the creativity of man, and one that results in a complete modeling of all known particles and forces. But at this moment, it is also important to note that there were many good things about the Music of the Spheres model www.crystalinks.com… for celestial mechanics as well. First, it got everything right. No known observation of stellar or planetary motions were in violation of its tenets. And whenever new experiments indicated that something might not quite fit, the celestial mechanics model exhibited the room for growth needed to accommodate any new experimental results. Additional spheres, cycles and epi-cycles were added to the model over time as new observations became verified. The analysis techniques were extremely complex, and it took practitioners of the time a decade or more to fully grasp the intricacies of the model. Furthermore, development of the classical celestial model involved man-centuries of effort by some of the best, brightest and most trained members of the globe. As a result, the classical celestial model was a monument to the creativity of man that resulted in a complete modeling of all known stellar and planetary motions. Please be advised that I am not attempting to mock the standard model by comparing it to the medieval and now discredited celestial model. I truly believe that the medieval celestial model was indeed a monumental achievement, and I feel it deserves much more credit than it presently gets. The credit should come because of its attention to detail, its coherent fundamentals, and its mathematically correct and exact derivations that led to explanations of all experimental data. It was indeed an impressive effort. However, Kepler and Copernicus showed us that a much simpler model was possible. And it is my belief that nature is simpler than the standard model as well, the details of which we will get into on my next thread in this series. The ABC Preon Model. Modeling the Massive Leptons. The first observation relevant to the ABC Preon Model occurred to me when I was a graduate student in the very early 1980’s. I noticed that the decay of the muon was extremely similar to the decay of a hydrogen atom from an excited state into its ground state. Below we see drawings of the two events. In the first drawing, we can see a muon decay. The muon decays into an electron, and two neutrinos. Neutrinos were believed to be either massless or nearly so. In the second drawing, we see hydrogen excited into its 2s state decaying into its ground state by emitting two photons. The photons are believed to be massless. Notice that muon decay appears in many ways to be similar to the decay of hydrogen from its 2s state. 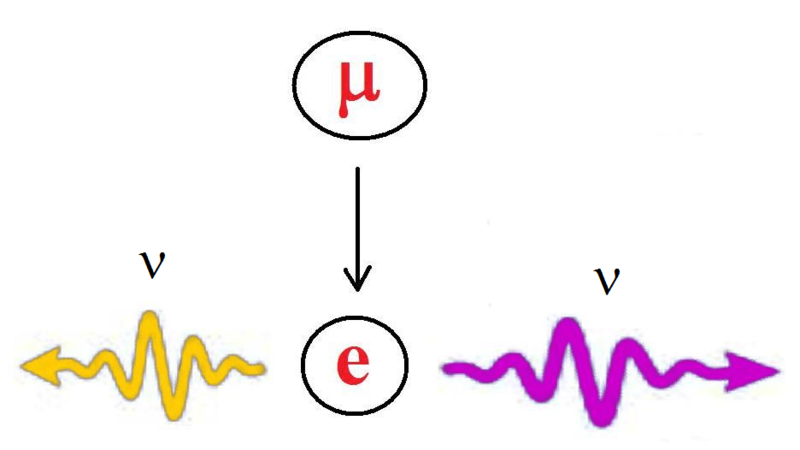 A muon decays into an electron by emitting two neutrinos, while a hydrogen atom in its 2s state decays into a hydrogen atom in its 1s state by emitting two photons. Here we introduce the standard notation for neutrinos and photons by denoting a neutrino by the Greek letter nu, and a photon by the Greek letter gamma. It is known that the hydrogen atom is very effectively modeled as a proton and an electron being bound by a photon, and therefore the starting point for the ABC Preon Model is to propose that the massive leptons consist of two new particles, called preons, bound by a neutrino. The word preon is meant to confer a precursor particle to the ones presently assumed to be elementary, and that is why I refer to this new model as a preon model. I want to emphasize how simple the onset of this new elementary particle model is. We simply look at the decay processes of Hydrogen and muons and propose that the internal structure of the muon is composed analogously to the internal structure of hydrogen. Since the radiated particle is a neutrino instead of a photon, we replace the photon by the neutrino. It is all just a simple observation at this point. 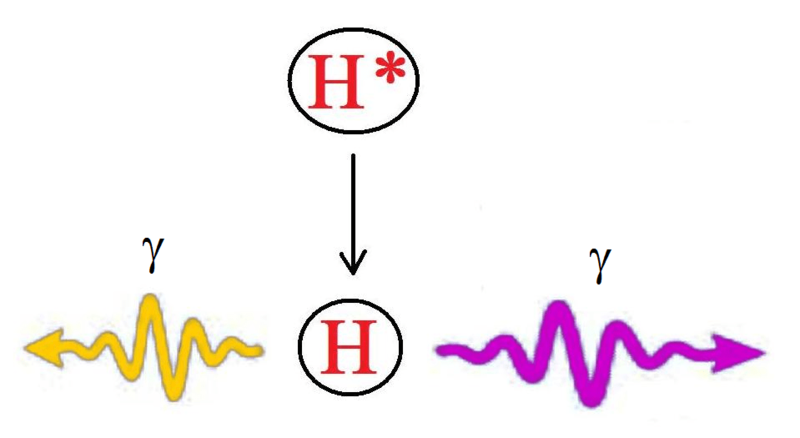 We’ve just seen how our analogy with the hydrogen atom has led to a proposal that the muon is the second quantum state of a composite system, and that the electron is the first quantum state. Of course, there is a third massive lepton, the tauon, that also has properties nearly identical to the muon and the electron, but with an even heavier mass. In the model proposed here, it is easy to identify the tauon as being the next excited state of the same composite system. And while the force binding the preon particles together is quite strong, neutrinos can still flow freely through matter as long as the cross section for the interaction is low. This is similar to the fact that some photons flow relatively freely through glass. What this all mean to us, ordinary mortals, not versed in physics lanquage as further explained by delbertlarson. “Both the Standard Model and the ABC Preon Model are models for elementary particle physics, which is the study of the ultimate building blocks of nature. The quest to answer the question “What is the World Made of?” is one of the great philosophical undertakings that has occupied mankind’s thoughts since the ancient Greeks. As for elements, in the ancient model, the world was thought to be composed of four elements – earth, fire, air and water. As history unfolded, additional elements were found and added to the list. Around the late middle ages, chemistry replaced the earth, fire, air and water model with a model of chemical elements. But the chemical element model was complex, as it involved around 100 elements, some of which came in multiple isotopic varieties. By the 1930’s it was appreciated that all elements were actually made up of three sub-atomic particles – the electron, proton, and neutron. However, by the 1950’s, experimentation with beams resulting from accelerators showed that there were vastly more sub-atomic particles – so many, that the situation was called “the particle zoo”. 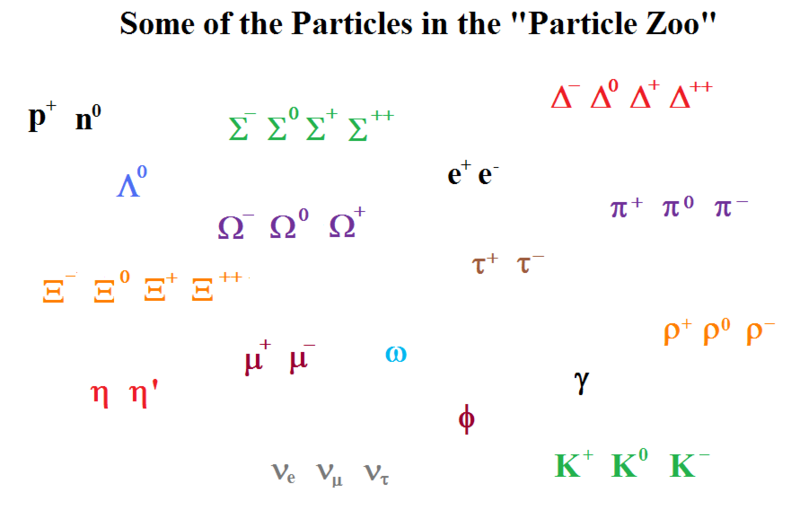 In the mid-1960’s it was theorized that the particles of the particle zoo could all be understood in terms of underlying particles called quarks and leptons. 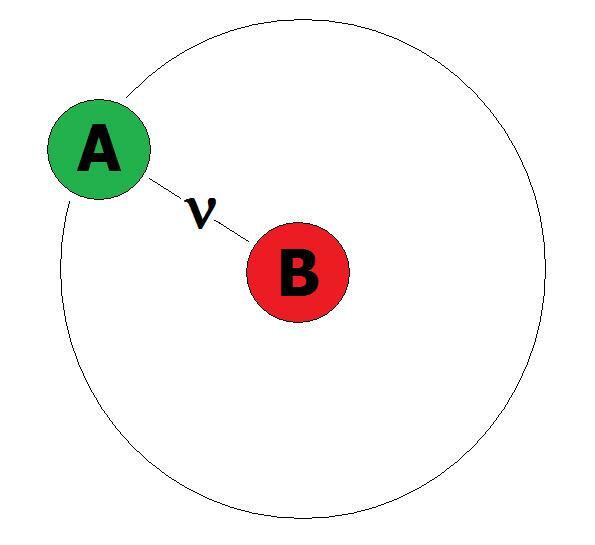 Today, the quark and lepton model has so many particle members that I call it “the quark and lepton zoo”, and the ABC Preon Model will show that there is a much simpler underpinning for all particles known to exist. Along with our increasing knowledge of elements (particles) we have also evolved in our knowledge concerning the forces that act within our world. Newton proposed several valuable laws, including a law of the gravitational force. Several scientists contributed to the study of electricity and magnetism, leading up to Maxwell’s equations. Lorentz and others found modifications to Newton’s force laws in the early 1900’s. The Standard Model has increased our knowledge with the elucidation of two more forces – the strong and the weak, as well as modifications to gravity. The ABC Preon Model advances our knowledge further, by identifying what is believed to be the weak force with simple quantum tunneling, further refining our knowledge. The ABC Preon Model. Assigning Some Quantum Numbers. At this point in our development, we can now move on to assign some quantum numbers to our preons. A first point of analysis is to note that to date, no experiment has shown the existence of free electric charge in fractional amounts. For that reason, we will begin by arbitrarily assigning our new A preon to have zero electric charge and our new B preon to have a charge of minus one. Since the neutrino has zero electric charge, this will leave our leptons as having a charge of minus one, as they must. Note that the antimatter leptons will have a charge of plus one, but we will deal with that topic later. Next, it is known that the neutrino has a half integer spin. In this model I am assuming that one quanta of the binding particle is contained within the composite particle, and hence, the A and B particles can either be both fermions or both bosons. Recall that Fermions are particles with half integer spin, while bosons are particles with integer spin. By adding two fermions one will get an integer value, and then adding the half integer of the neutrino results in an overall half integer spin. Similarly, adding the spin of two bosons results in an integer spin, and then adding the half integer of the neutrino results in an overall half integer spin. Recall that in all of these additions, spin is a vector quantity. So if we add a half integer spin of the A to a half integer of the B we will get either one or zero. When we then add the half integer of the neutrino we will either get one half or one and a half. We will get one and a half if all three spins are aligned. Since leptons have a spin of one half, this means that all three such spins cannot be aligned. A similar analysis can be done if the spin of the A and the B are bosons with integer values of spin, and that case will have similar constraints on the needed alignments. Also introduced in the picture above are the anti-matter counterparts to the massive leptons, as well as anti-preons. A line (also called a bar) above the letter identifying the preon indicates it is an anti-preon. It will turn out in future analysis that the massive leptons are actually made up of a B and an anti-A, rather than a B and an A, so that improvement to the model is introduced above as well. With massive leptons now modeled and their quantum numbers defined, we’ll see how hadrons get modeled in the next post. Post by ICycle2 at ATS. I’m not a medical practitioner and this is a private study based on my own understanding without any claims to cure. Nothing below is my work and free to be used as seen fit, I just put this study together to cure myself and it fortunately worked for me. All credit if any must go to RadiationAndCancer Apr, 7-2014 who triggered my research and who’s recipe I used. Warning – Please do your own research as some of the information found on the net can be misleading due to being bias towards marketing purposes. Cancer is when a cell becomes malignant and multiplies consuming/replacing normal cells. We also know triggers for cancer can be due to genetic, environmental, food and lifestyle factors. The thing to me is the what: What are triggers and what is the actual cancer? Bacteria, virus infections, radiation, faulty DNA, etc. can all be triggers but are not necessary the cancer. My understanding however is; that around 84% are parasitic fungi that grows causing the malignant mutations within cells where Bacteria and 7 known Viruses are the cause of the remaining 16 % (estimate). Then again most of the known bacteria and viruses can be cured by anti-biotic and/or vaccines after which they only leave a cell-wall or DNA with damage. But that is not necessary the cancer and only making it more acceptable in developing cancer. In cell-walls “free radicals” can also cause damage and be triggers. Example: We all know that people smoking for years are many times more receptive getting cancer when stopping. The why is in the study publishing January 26, 2017 in the open-access journal PLOS Biology by Marie-Liesse Asselin-Labat and her team of the Walter and Eliza hall Institute of Medical Research, Australia. In short: the exposure to the smoking chemicals causes damage to the DNA of the lung stem cells. This in turn produces flawed new cells making it more receptive to infections (bacteria and viruses) and/or fungi/yeast which we inhale as microscopic spores every day. This direct contact is why the lungs are standing out as the unparalleled example. 4) Organic foods and natural products 20% slow cooked foods maximum. Most enzymes are destroyed at temperatures from 104 degrees F (40 degrees C). Sodium bicarbonate is a natural chemotherapy that effectively kills fungi cancer cells while dramatically reducing the brutal side effects and costs. It is many times more effective than medical approved chemo but you will struggle to find statistics and there will never be approved scientific documents. But let’s put that behind us, as the fight is against cancer. Therefore I suggest you get the book “Rich Man’s Poor Man’s Cancer Treatment” or study how the alkaline pH and Bicarbonate of Soda method works. It’s your life. The fact of the matter is that it could be done while busy with medical approved therapies without interference. Fungi could not spread nor survive in an alkaline environment. Bicarbonate of Soda is alkaline therefore killing fungi. The problem is that parasitic fungi (cancer cells) will shut down and not absorb the Bicarbonate of Soda to protect itself. By mixing it with honey/molasses it will be absorbed by the fungi as it feeds on sugar/glucose. That is why a molasses/honey mix into a paste with Bicarbonate of Soda is effective when placed on skin cancer (melanoma). Difficulties with this method are the different pH levels inside the body. It could be challenging to achieve an alkaline environment at a specific point and the sugar based mixture could also affect people with diabetes. It is however the most effective natural way of getting rid of most cancers and was even described as a cancer cure in the ancient Indian literature. Example: Take your swimming pool. If your water pH is not correct it does not matter what you add. The fix will only be temporarily. The higher the oxygen level in your blood, the more alkalise your blood becomes. Oxygen deprived cells can easily becomes cancerous and cancerous cells cannot survive in high levels of oxygen. The body needs Iron that metabolise into haemoglobin the main carrier of oxygen. And Iron needs Copper to be better absorbed by the body. Luckily most foods containing iron also have more than enough copper. Exercise while breathing deeply, oxygen tents or hyperbaric chambers are all highly beneficial for people seeking natural cancer treatments. Warning – Just eat right and do not (if you must) over supplement, as to high levels of iron could be dangerous. Fasting for as little as three days can regenerate the entire immune system, even in the elderly, scientists have found in a study. Look at your lifestyle: Hormones like cortisol and adrenaline are produced when we’re stressed, which is beneficial in short bursts. However, if you suffer from chronic stress it can be very negative as it weakens the adrenal glands a key component of the immune system. The more balanced your life is, the less resources will be needed for stress related functions in the body. Allergies, sinuses, respiratory tract and parasites: There are just too many natural cures available to allow the immune resources to be drained by this. Just Google, study and fix it. Foods: If you want to single out a product to boost your immunity amongst the many available, feel free. Just remember that; depending on what is causing the immune deficiency you could end up with a wrong product. And the “Super” marketing trick made every product basically a “Super” fruit, spice or something. Its very simple “just be sure your intake is balanced and healthy” Personally I will just pump myself full of normal Vitamin C and not Super Vitamin C when it feels like I’m going down with something. There is no consensus amongst medical professionals about the food – blood type connection. I personally lean towards those believing in it. Restricted and Avoid. Then make a monthly pre-planned daily intake list for Breakfast, Noon and Supper. Consecrate your morning intakes around your Iron, Magnesium and Potassium intake. Your noon intakes if possible, around meat/fish, rice, vegetables and/or salads (main). Your supper can either be the leftover of the day and/or smoothy’s to fill the gaps using what you still need to stay balanced. Some of the compounds in food we eat cannot be absorbed directly by the body. Gut bacteria, minerals and vitamins break them down, forming the chemical binding, which makes it possible to be absorbed in the bloodstream. But then we also have unhealthy gut bacteria which normally get eliminated by natural foods and body functions. But using a parasite zapper like Olive leaf extract from time to time are maybe a good idea. There are also an abundance of other natural products that can be use to kill unwelcome invaders. Garlic is packed with sulfur-containing amino acids, which help to combat parasites. A compound in garlic known as allicin also helps to kill and expel worms – but the garlic must be sliced, diced or chopped to fully release it. The more finely garlic is chopped, the more allicin it releases. After mincing or dicing garlic, let it sit for a few minutes to allow this chemical process to occur. Alternately, you can chew it for at least a minute. Papaya & Pineapples have amino acids, digestive enzymes such as papain (found in papayas) and bromelain (found in pineapples) can create an unfriendly environment for protozoa and helminths alike. The value of this traditional natural remedy for intestinal parasites was confirmed in a placebo-controlled study published in Journal of Medicinal Foods. Sixty children were treated with a mixture of air-dried Carica papaya seeds and honey, resulting in parasite clearance rates that ranged between 71.4 percent and 100 percent. Researchers praised papaya seeds as an effective, cheap and safe way to treat human intestinal parasites. Pumpkin seeds are tasty, crunchy and nutritious. They also have the ability to paralyze helminths, allowing them to be easily flushed from the body, and have been traditionally used as a remedy for parasites. Some natural health experts advise blending a cup of raw pumpkin seeds with half a cup of coconut milk and half a cup of water, then eating the resultant paste – following up with a glass of water. Although pumpkin seeds can be very effective, results may not be immediate – you may need to repeat the treatment several times. Oil of oregano is highly antimicrobial and made from Oreganum vulgare – can be very effective against intestinal parasites. In a study published in Phytotherapy Research, adults who were infected with three different types of parasites were treated with 600 mg of oil of oregano a day. After six weeks, parasites were totally eradicated in 72 percent of the participants; 23 percent greatly decreased their parasite load. Because researchers think that oil of oregano gets its anti-parasitical powers from carvacrol, be sure to use oil standardized to at least 65 percent carvacrol. Neem tree properties are antibacterial, antifungal and antiviral and have been used in India for thousands of years to reliably kill parasites both internal and external. The neem tree, scientifically known as Azadirachta indica, is native to India, where it serves so many medicinal purposes that it is often referred to as “the village pharmacy.” One of neem’s assets is that it not only kills parasites, but also removes the toxins they leave behind as they are dying. This detoxifying property of neem also makes it to the liver, which is often compromised by parasitic infection. Wormwood, black walnut and cloves have pronounced anti-protozoan effects, and is particularly effective at killing parasitic larva. In addition, it stimulates macrophages, which are a key in immune system defence against parasitic infestation. Wormwood is often combined with black walnut, or Juglans negra, and essential oil of cloves. The juglone in black walnut helps to kill parasites, while antimicrobial oil of cloves can destroy virtually all parasite eggs in the intestinal tract. Using these three substances in combination can interrupt the parasitic life cycle, terminating these pests for good. Chlorophyll all parasites hate chlorophyll therefore eats lots of green leafy herbs and vegetables to get rid of them. Finally, it is essential to sharply reduce and/or eliminate sugar, grains, pork, smoking and alcohol. Important factors this research highlighted. We need a lifestyle change!!! 11) Good, now let us look how we get our food to cell level. a) Some compounds in food lack a binding (absorbing) agent and cannot be absorbed directly by our bloodstream; therefore it needs our gut bacteria and/or combinations with other compounds like minerals and/or vitamins to it break it down to be absorbed. b) Electrolytes are ions in our blood that is necessary for the electrical current in our bodies to control for instance the heart, enzyme operations, muscle contraction, cell abortion, etc and form “lets call it highways in our bloodstream”. Of which sodium and potassium are the main balancing ingredients. c) There are many Taxis using these highways in our blood of which Magnesium is one that delivers more than 300+ substances to where needed (like for instance Calcium). d) Magnesium will deliver calcium to the bones where it is stored but will take from the bones to deliver when needed in another part of the body. e) It takes around 15 min to reach cell level from intake where Potassium aids with the absorption at cell levels. Other Taxis of note are: Iron for oxygen, Zink helps restore your immune and digestive systems and can be seen as the glue that holds the body together, Silicon, etc. Coffee – Studies over a 10 year period were concluded in May 2016 and did not find conclusive evidence that coffee is a cancer trigger. It actually has healing properties for brain, throat, and oral cancers. To myself and all coffee lovers, coffee is not a cure or trigger when consumed, but any form of consumption over 65 degrees is a problem. The “RadiationAndCancer” recipe I used: (20 days – 1 week break – another 20 days – (the 2nd 20 days is a double precaution as you got nothing to loose). Incorporate a parasite zapper like Coriander Silver or Olive leaf extract if unsure how the cancer was induced. Get over your shock, ask your Doctor the necessary and start fighting the correct way. Once done after the 20 day period bring your pH down to between 7.31 – 7.45 and keep it there for the rest of your life. Tip: In normal life when waking up drink 1 tea spoon of honey and half a squeezed lemon with 250 ml of warm water every day for the rest of your life. Always keep track of your pH and supplement as needed. Decide how you feel after 3 weeks. If you cheat you do not cheat me. 6) The rest is basically to keep the body environment balanced while on medication. But it does not stop there; start living healthier even after the medication period. Listen to your body and do not overdo or cut any food groups from your diet but check for compatibility against your blood group/cancer foods and only cut the specific foods to be avoided. Yes, the Medical profession are bound by guidelines only to follow approved medical methods enforced on them or could loose their licences and therefore will not look at, or advice alternative methods. Some do take risks by advising alternative or natural therapies off the record. The science behind it is however flawed because of money and therefore the intolerance to look at them. Natural products cannot be patented; therefore companies try to make generic products based on the most effective natural products, which they are allowed to patent. One “Big Pharmaceutical Company” tried to patent Olive Leave Extract because of its effectiveness. Pharmaceutical companies however did discovered and developed many drugs that have had an enormous positive impact on human health. Unfortunately some criminal action/tactics and certain products that cannot be trusted are beyond belief. That makes it clear to me why cannabis will only become legally available through a licence, to control the money, as it cannot be patented. Chemotherapy is criminal in a high percentage of cases; as it poisons rapidly-growing cancer cells it also destroys developing healthy cells that can lead to serious complications in other parts of the body like chemo brain to mention one and will also break down the immune system. Most chemotherapy’s are even more toxic that hydrogen cyanide which is formed by enzymes breaking down Amygdalin found in apricot seeds. But you will only hear how bad Vitamin B17 (Amygdalin) is. There will always be enough science to find some natural products dangerous but never enough to find it approvable like chemo. Download and watch this video Cancer the Forbidden Cures (Time length 01:32:46 – 270Mbytes at 480/360 frame resolution) Or choose a resolution that suite you. To me it looks like the carrot juice recipe could be done in tandem with the 20 day recipe. But be careful to choose a route and follow it for a period of time. Then get a scan and/or your blood tested which should tell if it’s working. If not, choose a different route. Do not use multiple routes at once as certain products could possibly counter balance each other. Colloidal silver, olive leaf extract, pumpkin seeds, neem tree extract, chlorophyll, garlic and many more products kills parasites like fungi, viruses, bacteria and worms. Keep these parasites at bay and your chances of ever getting cancer are very slim. Meso-Iridium colloid (M-3 is 70% rhodium, 15% iridium and 15% gold) others to investigate are rubidium, doxycycline, caesium, mebendazole, dichloroacetate and many more. Vitamin D is made in the body by the sun shining on our skin (UVB radiation) and cholesterol. 5 – 10 minutes between 10:00 am and 3:00 pm moderate exposure/day should be sufficient for the making of calciol and 25-hydroxyvitamin D3 in the liver. Vitamin D3-Sulphate is water-soluble, which lets the sulphate form of vitamin D travel freely in the blood stream. Vitamin D deficiency has the greatest impact on cancer rates. Vitamin D is extremely important for regulating cell growth and for cell-to-cell communication. Vitamin D has an influence on more than 200 human genes, which can be restricted when our Vitamin D levels are low. My research proved to me that there are a number of cures in natural products and/or combinations that are not investigated by “Big Parma” due to the money involved. I feel the above 20 day recipe and your balanced diet will be enough to cure most cancers. Hope you can start before to much damage was done. NB! Although this quick fix method will work in most cases, others will need a prolonged period of medication to heal due to the severity and varied pH conditions in the body. My grandfather’s grandmother on his mother’s side had a farm (South African west coast) that produced cannabis until it was banned. They grew it as medicine and never smoked it. My grandfather and his siblings made a tea or mixed it with milk until they died at 96, 97 and 102. Other siblings did die at a younger age due to different reasons from falling of a horse to others, but nobody in the older generation ever had cancer.